Music has featured more prominently than poetry for me in 2015, and in many ways the most significant event was the launch of the High Moss label. The aim of High Moss is to make much of my recorded music available for people to listen to and to buy. This is something I've wanted to do for many years, but this year I came to terms with the technology to make it happen. High Moss has released four albums in 2015, although this does not mean I have been incredibly prolific – three of them were ready for release in 2014 but had to wait until I ironed out certain technological and communicational hiccups. Chief among these was PayPal's reluctance to accept that I could have an address without a house number and street name. I have been intrigued to notice that two of the albums, Red Nocturnes and Winter Solstice, have been selling significantly more copies than the other two, Windhouse and Speech Songs, and this despite the fact that Winter Solstice has only been available for a couple of weeks. Now I know Windhouse is a tough and challenging listen, but I might have expected Speech Songs to catch more people's attention through its use of poetry and the speaking voices of poets Catriona Yule and John Mackie, as well as my own voice. 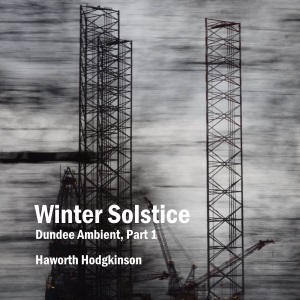 Still, I'm glad Winter Solstice is doing well, as it has been my major composing and recording project of the year, albeit using sounds mostly recorded in Dundee in the 1990s and digitised in 2011. Winter Solstice is the first part of a bigger project called Dundee Ambient, and I hope to release the remaining parts during 2016. 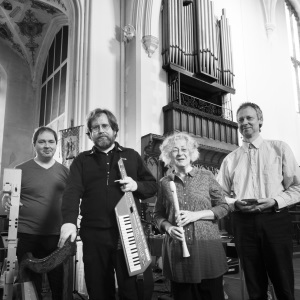 The other major musical project that has been occupying me this year has been organist Mark Spalding's celebration of the 40th anniversary of the composition of Karlheinz Stockhausen's Tierkreis. We have given duo recitals in Dundee, Inverness, Arbroath, Edinburgh and Perth, in which our organ-and-percussion version of Tierkreis has been set against music by other composers, including two performances of an organ-and-percussion version of Morris Pert's Cul Mor. In parallel with these duo performances has been a sequence of concerts by the ensemble Mars in Aquarius, in which Mark and I are joined by Mandy Macdonald and Colin Edwards to perform some of Stockhausen's intuitive music compositions from the late 1960s. Mars in Aquarius has performed this year in St Andrews, Aberdeen, Dundee, Arbroath, and two different Montrose venues. The Tierkreis project comes home to Aberdeen with a duo performance in January 2016, and Mars in Aquarius has plans to work on intuitive music by other composers, notably Cornelius Cardew, in the year ahead. In October I took part in two electro-acoustic events in Aberdeen at the invitation of the sonic arts organisation sonADA. The first of these, part of sonADA's SlowCooker series, took place in the Suttie Arts Space, a public arts venue within the Aberdeen Royal Infirmary complex that is open 24 hours a day, seven days a week. I introduced two of the pieces on my Speech Songs album and played them to an extremely attentive audience, and the programme also included music by Kim Cascone and a live coding ensemble from the University of Aberdeen. The second event, to a much less attentive audience of diners at Aberdeen's Musa venue, was a late-night Halloween session as part of the Sound Festival. Composers Suk-Jun Kim, Francesco Sani and I each produced a new piece for this event. Having had previous experience of Sound Festival sessions at Musa, I had deliberately made a loud piece to try to keep the audience's attention – in vain as it turned out: the audience just talked louder to be heard over it. The effort wasn't wasted though – I worked on my piece afterwards and hope to issue it eventually through High Moss. Music for live theatre is something I am not asked to do often these days – the Aberdeen theatre scene is not as adventurous as Dundee used to be in the 1990s – so I was delighted to be asked to make some music for Fiona-Jane Brown's Hidden Aberdeen Tours company this year. 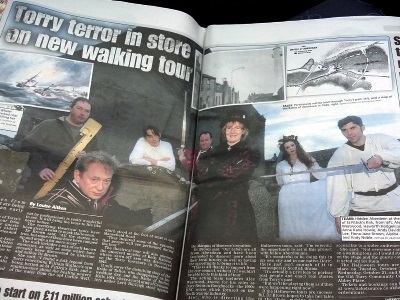 Terror Tales of Torry was a series of guided walking tours, illustrating some of the ghosts of Torry's past in street theatre scenes with an intrepid bunch of actors: Alec Westwood, Aiysha Jebali, Anne Kane Howie, Andy Davidson-Lee and Andy Noble. The company seems to prefer actors with names beginning in "A". If poetry has taken something of a back seat in my journey this year, it hasn't been altogether left behind. Only one poem has been published this year. I had five published in 2014 and five in 2013 – I think my poetry is somewhat at odds with the style that is in fashion with editors at the moment. Fortunately promoters of live poetry events still seem to like what I do. A highlight this year was in April when I was invited to Platform Poetry in Ladybank, to appear with Beth McDonough, John Mackie and Anna Lavigne. Other guest spots were at a Gordon Forum for the Arts party in Inverurie and at Books and Beans in Aberdeen. I cannot end my review without mentioning some of the well-known and well-loved figures on the North-East writing scene who have died this year. Brian Nisbet had been ill for several years, but lived to see his book Now You Know appear in print. This was one of the finest poetry collections I have seen for quite some time, and many of the North-East's leading poets read favourite poems from the book at poignant tribute events in Ellon, Huntly and Aberdeen. The poetry of Angus Dunn also appeared in a collection for the first time this year, though he had several publications as a fiction writer. His collection High Country appeared shortly after he died, and we read from it at a tribute event in Huntly. Angus is remembered by many not just for his writing but for the support he gave to the North-East literary scene as writer in residence to Aberdeenshire in the 1990s. The third major poet we lost this year was Margaret Grant, whose Doric verse displayed both sharp wit and touching sensitivity. Her popularity was reflected in her appointment as Makar, and plans are underway for her collected poetry to be published next year. The North-East will be a poorer place without these leading figures, but their poetry remains for us to enjoy. Many of the creative people and organisations I had the pleasure of working with in 2015 have their own Facebook pages. If you are a Facebook user, please support the local artistic community by liking their pages and helping them to spread the word about what they do!